The fundamental of any Smart Home is a product that brings together the various different systems in a house and makes them behave like a single, unified system. At Electrobyte we use Control4 because, in our opinion, it is the best system available. 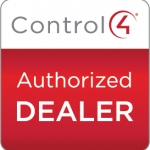 Control4 has thousands of drivers for almost every device imaginable – lighting, heating, entertainment, internet services, blinds and more. Control4 also has an simple, intuitive interface that is the same no matter what the device – whether a TV, touchscreen, smartphone or tablet. This means it doesn’t matter how you interact with it, you will always get the same experience. Couple all this with Control4’s legendary reliability and you have the ideal product for integrating the various smart systems in your home. Lighting controls such as KNX, Rako, Lutron, Philips Hue etc. Heating controls such as Heatmiser, KNX, Nest, Honeywell etc. Audio-visual equipment such as TVs, AV receivers, projectors, BLuRay players, media streamers etc. Blinds and curtains such as Somfy, Qmotion, Silentgliss etc. Security systems such as CCTV, intercoms, intruder alarms, electronic locks etc. This list is not exhaustive as almost anything can be integrated to a greater or lesser extent. And if there isn’t a driver already available for a product we can make a custom driver ourselves.